Booking: bank deposit payment for the hunt organization. 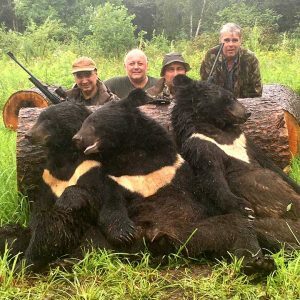 Trophy fees in cash on the spot after the hunt. – Hunt organization office tax..
Movie: Possible professional movie shooting during the hunt. Price per Order. Located at the heart of Central Asia, Kyrgyzstan is known for incredible natural beauty and proud nomadic traditions. Also known as the ‘melting pot’, Kyrgyzstan is a home for over 5 million people of 80 different nationalities. With a total area of 198, 5 thousand sq. km (76, 640 sq.mi) it is about the size of Nebraska, and borders with Kazakhstan, Uzbekistan, Tajikistan and China. Kyrgyzstan has been under the Soviet rule from 1924 to 1991, when it gained independence and became a democratic republic with a parliamentary government. 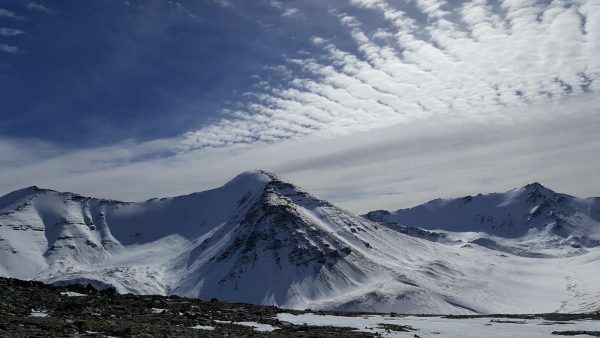 The country is almost completely mountainous, being found at the juncture of two great Central Asian mountain systems – Tian Shan and the Pamirs. More than half of Kyrgyzstan lies at an elevation higher than 2, 500m (8, 200ft). Only about 1/8 of the country’s territory lies lower than 1, 500m (4, 900ft), while glaciers and permanent snowfields cover more than 3% of total land area. Kyrgyzstan’s highest point, the Victory Peak, named after Soviet victory in World War II, is 7, 439m (24, 406ft) high. Snow-capped mountain peaks, crystal clear lakes, rushing streams, highland pastures and meadows, unique flora and fauna are what make up the land of this small country. Once a stop-point for merchants and travelers along the Great Silk Road, it was an oasis and a welcome relief after crossing perilous mountain passes on the way from China. It was this very road that had brought the famous Venetian explorer Marco Polo to these lands to later discover the world’s largest and most magnificent sheep in 1273. These sheep Marco Polo had described to have horns “three, four and even six palms in length”, which is why they hold an almost mythical status to any trophy hunter to this day. Climate: The country’s climate varies by region. While it’s subtropical in lowland Fergana Valley in the west, the climate is temperate in the northern foothill zone. 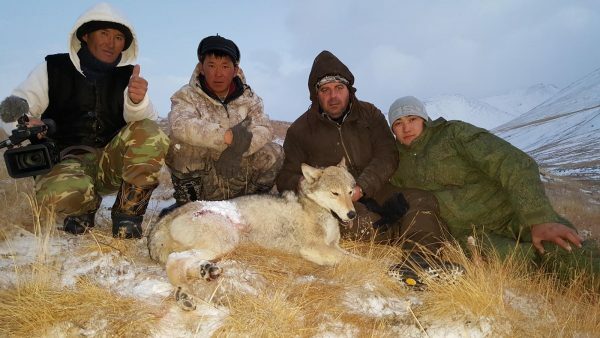 The lower mountain slopes have a dry continental climate, as they receive desert-warmed winds from Kazakhstan and Uzbekistan, whereas the highest mountain elevations, where most of the hunting is conducted, have a polar climate. In the valleys, the average daily temperature in July is 28° C (82° F). 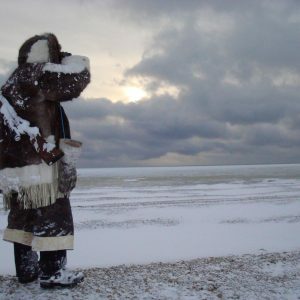 In January daily averages are as low as -14° C (7° F). Conditions are much colder at high elevations, where in July the average daily temperature is 5° C (41° F) and in January -28° C (-18° F). 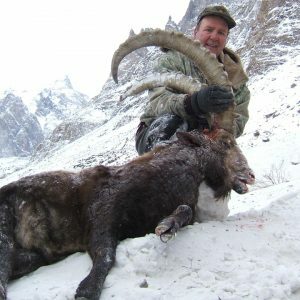 Marco Polo hunting is very physically demanding and hunters need to be experienced mountain hunters. Elevations vary, depending on location. 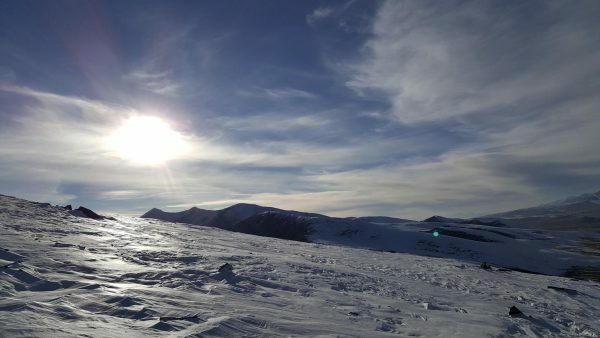 Base camps are between 10,000-12,000 feet with hunting up to 13,500’. Most people do not get altitude sickness, but a medication called Diamox can be taken to alleviate most symptoms. We also recommend that our clients take Wilderness Athlete’s High Altitude Advantage. Arriving in good physical condition will help also. 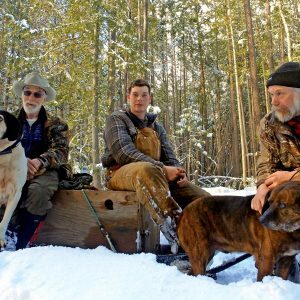 On the first day or two of your hunt, we try and take it easy so that you can rest up and adapt to sleeping and hiking at these higher elevations and conditions. Common effects of this elevation include: shortness of breath, elevated pulse and blood pressure, headaches and a tired feeling. After a few days, most people adjust to the altitude and see noticeable performance improvements. Hunt Conditions: Good physical condition is mandatory. 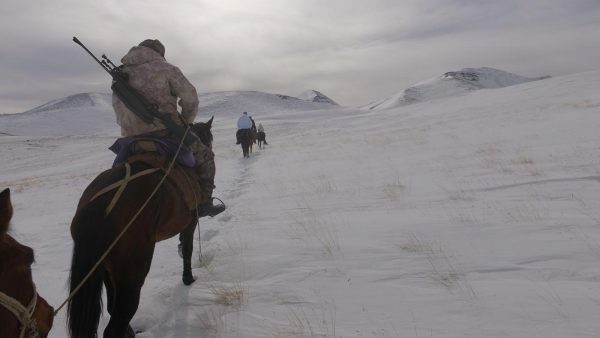 Base camps are between 10–12,000’ feet and the hunting takes place from camp elevation up to 13,500’. 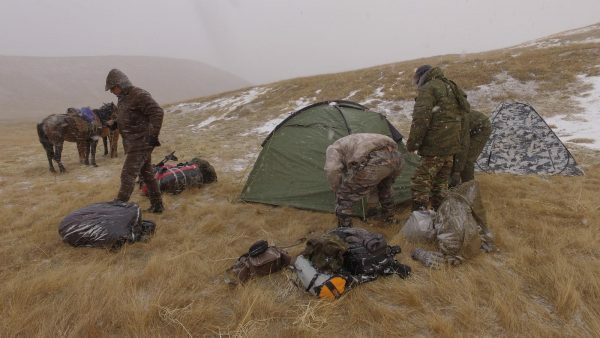 The air is generally very dry; however the biggest challenge (especially on winter hunts) is to stay warm. You will need a good mat and sleeping bag to keep warm and dry, as sometimes you will stay at fly/spike camp for a couple of days. We provide Hilleberg tents and compact stoves for these excursions. 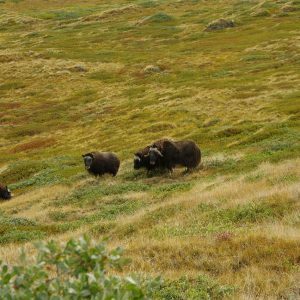 The Hunt – Generally, especially on the cold, late season hunts, we’ll often come back to the base camp at night, but spiking out is an option for the more prepared, adventurous and ambitious hunters looking for big rams. 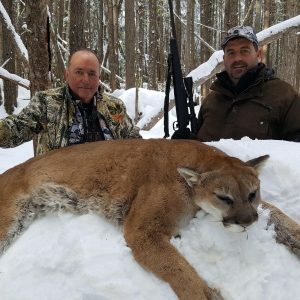 Spot and stalk hunting is the preferred method of hunting as it allows us to judge the animals with spotting scopes, before making the final stalk. 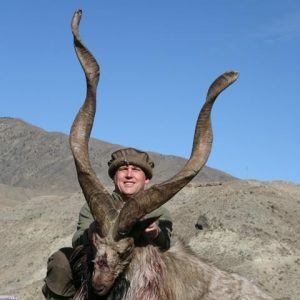 Hunters typically see many animals on Marco Polo hunts, including Ibex. 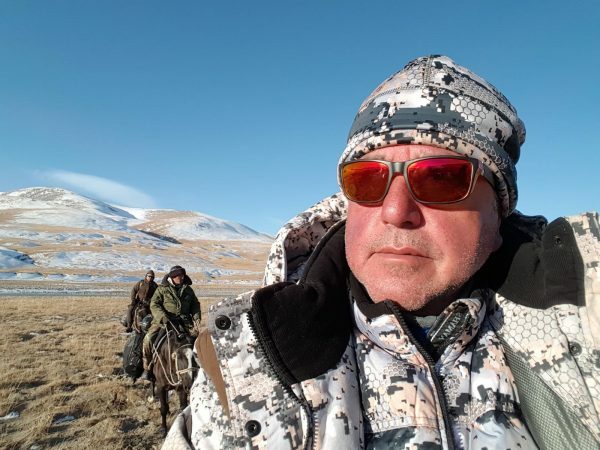 On a typical day, hunters could see several hundred Ibex and Marco Polo, but in some areas, hunters might only see 10 animals in 1 day. Game densities and ram size can and will vary with location. 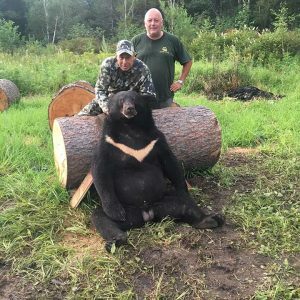 We will put hunters in the areas to best meet their hunting goals and physical abilities. 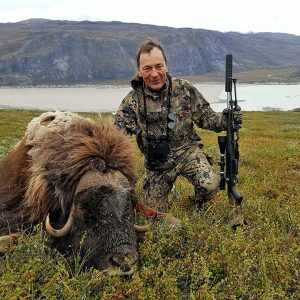 Due to the difficulty and longer distances (250-550 yards) of the rifle shots required, many hunters miss game. We highly recommend taking a professional shooting course so that you have the skills necessary to use a rifle and scope with custom reticule and/or turret and so you don’t miss.